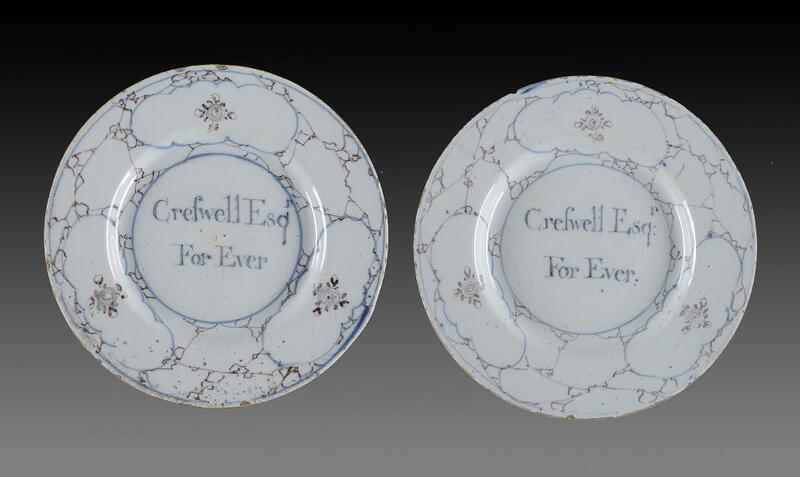 A PAIR OF BRISTOL DELFTWARE PLATES, C1750-60 in a slightly bluish glaze and inscrived in blue Crefwell Esqr For Ever, in a blue and manganese 'cracked ice' border reserved with three flowers, 23cm diamThese plates relate to the candidacy of Thomas Estcourt Cresswell (1712-1788) of Pinkney Park, Wiltshire, Member of Parliament for Wootton Bassett, 1754-74. The son of Richard Cresswell, MP of Sidbury, Shropshire by Elizabeth the daughter and heiress of Sir Thomas Estcourt of Pinkney Park, he stood in 1754 on the St John interest in Wootton Bassett where he was returned after a violent and expensive contest. He was returned again unopposed in the elections of 1761 and 1768. He did not stand in 1774. His private life was colourful being accused, with good reason, of bigamy and subsequently the attempted murder of both his wives. His cousin Lord Ducie described him as "a very great villain" (Source: History of Parliament online).Three other Bristol Delftware plates decorated with a blue and manganese 'cracked ice' ground are illustrated Britton (F), English Delftware in the Bristol Collection, 1982, figs 12.56-12.58. Provenance: Rt Hon Ernest Marples, PC, Minister of Transport, Baron Marples (1907-1978, thence by descent.